Is the Man Who Is Tall Happy? 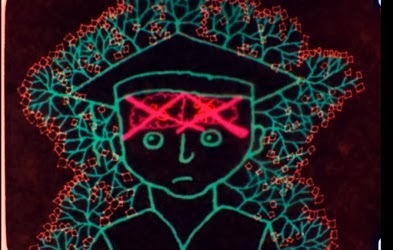 should be seen less as a straightforward documentary on Noam Chomsky and more like a conversation as an animated illuminated text. In the introductory bit by Michel Gondry, he seems to acknowledge this himself, bringing up notions of visual language and its interplay with actual language. That became a larger point of interest for me as I thought more about the film as a whole. My word/image interest aside, the overall feel of Is the Man Who Is Tall Happy? is less like 1992's Manufacturing Consent and more like My Dinner with Chomsky, but without the dinner or the overt sense that this conversation is moving toward the crystallization of a personal epiphany. 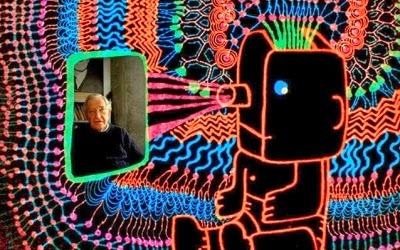 The whole film consists of a series of free-wheeling conversations that Gondry conducted with Chomsky, covering biographical information and some of Chomsky's theories on language development and acquisition. 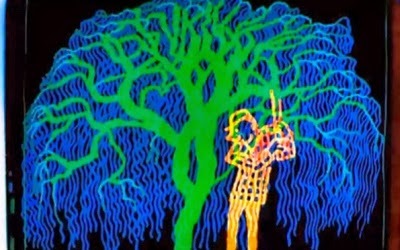 As various points are explored, Gondry's hand-drawn animation tries to find appropriate visual accompaniment. The results look like high school notebook marginalia gone psychedelic, but in the best possible way. 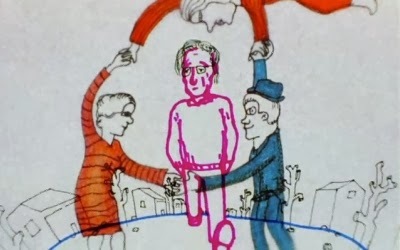 What's odd is a distracting impulse by Gondry to interrupt his animation with Bolex footage of Chomsky. It doesn't fill the screen, but merely a small portion of the screen. The camera whirrs while he speaks, and while we seem him in that small bit of screen, it's the sound of his image being taken that obscures some of the words. It's an annoying affectation that I wasn't a fan of, but I think part of it plays into this larger relationship between word and image in the film. In one sequence, Chomsky speaks about old ways of thinking about language in terms of rigid categorization of the parts of speech. Gondry animates file cabinets and card catalogs, which is a fine analog for this idea. Other images he chooses, such as honeycomb structures, seem to be entirely his own, and yet these do inform the ideas being discussed. While Chomsky returns to points about continuity when he speaks, Gondry finds a visual continuity to return to that's at once fueled by what Chomsky has said and by what's going on in Gondry's head. These are layers of language and conversation: there's Gondry's visual language and Chomsky's verbal language; it's also the disparate languages of two minds, with (broadly) Gondry's notions being more aesthetic while Chomsky's are more analytic. If Is the Man Who Is Tall Happy? was simply a transcript, it would engage but only so much. Similarly, if Is the Man Who Is Tall Happy? was just the animation, it would engage but only so much. Despite its occasional annoying choices, I think movie finds this fascinating and even beautiful tension when it melds the languages and concerns of these two minds. The images inform the words, the words inform the images, the minds misunderstand each other leading to points for clarification, and so on. There's even an added layer of conversation when Gondry second-guesses himself in retrospect. He calls himself stupid, he regrets framing questions the way he frames them, and he even wonders why Chomsky is answering a different question than the one he asked. The mind gets to clarify itself when it needs to, and the film might be just such an act of clarification. Visualization is a great means of clarification given how counterintuitive some of Chomsky's ideas on language can be. Sometimes language is the worst vessel to explore the nature of language. When dealing with cognition and very difficult or abstract concepts about how language comes to be, we realize a) how language itself is limited in its ability to convey or reveal its own nature, b) how the expression of a thought in our heads can differ greatly when it's manifested in written or spoken language, and c) how another person can inadvertently misunderstand your thoughts when such thoughts, no matter how carefully phrased, are expressed in language. By giving Chomsky's ideas a visual component and by cycling back into the text of language to find a non-textual mode of communication, a greater kind of understanding may be possible. Apart from the Bolex, I think Gondry makes a misstep late in the film when he asks Chomsky about his wife. Most of Is the Man Who Is Tall Happy? is rife with Gondry's characteristic whimsy, yet the way that the question and answer is presented gets a little too sentimental. It's not unwarranted and there's also been an underlying undercurrent of sentimentality in much of Gondry's work, but it's a matter of proportion. When the question and answer came, I winced a little at the presentation even though I understood the impulse to play up the emotion. For me, it's the simple imagery Gondry chose and Chomsky's voice that were heartfelt; the music that's played over the moment (in essence another participant in this conversation) threw off the moment. One little choice and it winds up saying too much; film language is fascinating that way. But even then, there are so many weird joys in Is the Man Who Is Tall Happy? that seem genuine, like when Gondry animates the puzzle of Theseus' ship. It's a fundamental epistemological riddle about identity that you hear in Philosophy 101; it's one of the closest things the Western philosophical tradition has to a Zen koan. And this ship, like other details and ideas expressed visually, has resonance throughout the film. The same goes for ideas about trees and circuits and scientists seeking simplicity. Even though it does meander, that's not a bad thing. Is the Man Who Is Tall Happy? held my attention on a visual and intellectual level, and it charms in its own unique way the entire time. Earlier in the year, Chomsky got into a bit of a beef with Slavoj Žižek, another prominent public intellectual. This month, both of them have films out in theaters. Žižek's is The Pervert's Guide to Ideology directed by Sophie Fiennes, a follow-up to The Pervert's Guide to Cinema. I've joked to friends that their intellectual disagreement (which is basically another round of the analytic philosophy vs. continental philosophy fight) should devolve into a childish comparison of indie movie box office returns. What I'd really like to see is Chomsky and Žižek swap directors. Have Gondry talk to Žižek, the animation constantly trying to keep up with the discursiveness; have Chomsky in a monologue about political matters, with Fiennes grounding him in film set recreations that fit the overarching topic. What weird but welcome conversations those would be. Is the Man Who Is Tall Happy? screens on Thursday, 11/21 at SVA with Michel Gondry and Noam Chomsky in attendance. The film opens in limited release on Friday.